The Scotland Office has announced that Director Francesca Osowska will be leaving the department later this year. Francesca, who joined the Scotland Office in January 2015, has played an instrumental role in overseeing the implementation of the Scotland Act 2016, following the recommendations of the Smith Commission. She will begin her new role as Chief Executive of Scottish Natural Heritage in October 2017. Since January 2015 Francesca has been a dedicated and enthusiastic voice for Scotland as Director for the Scotland Office. From ensuring the powers recommended by the Smith Commission were delivered in full, to engaging fully with Scottish businesses as we prepare for our exit from the EU, her tenacity has helped me ensure Scotland’s voice has been heard at the heart of Westminster. On behalf of the Scotland Office I thank her for all her hard work, and warmly congratulate her on her new role. 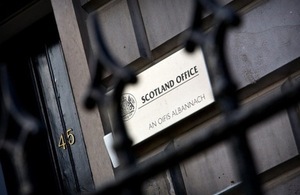 It has been a pleasure and a privilege to serve as the Director for the Scotland Office for over two and a half years, ensuring that Scotland’s voice is heard in Whitehall and Whitehall’s voice in Scotland. From overseeing the implementation of the Scotland Act 2016, to witnessing the UK Government’s implementation of transformative City Deals, it has been a truly rewarding experience. I would like to thank all my colleagues and wish the Scotland Office and its Ministers continued success in the future. A competition to appoint my successor will start shortly to ensure a smooth transition before I take up my post with Scottish Natural Heritage on 2 October.